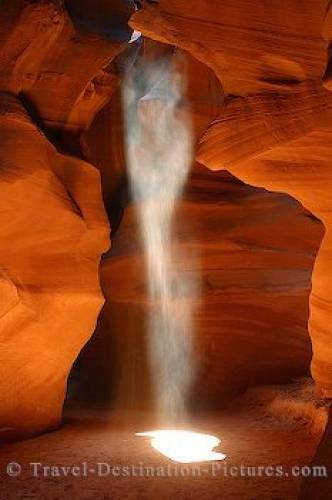 The once-secret Antelope Canyon is today bustling with photographers and tourists frm all over the world. Nonetheless you can still catch the beauty and majesty of this place with a little preparation. This shot was made in a group of about 6 photographers lining up in front of this subject, pointing out one of the group every time to run 200 meters out to get dry sand and throw it in the beam from behind the edge to let the others photograph this fantastic view.